When I left Sapporo at the end of July, Odori Park was in the midst of a summer beer festival. When I returned in September, it had moved onto an autumn food festival. Me and this city were bonding. ... and spiny black balls that looked like hand grenades. I did a double take as someone passed me with two balanced on a plastic plate. Was this a military training exercise or a snack with extra punch? Should I wrestle the man to the floor and call the police or... watch while he cracks one of the demonic spheres open and probes it with chopsticks. I tried to take a photo so I could demand answers from a safer distance but black spines on a black ball had stealth bomber properties for my phone camera. Short of propping my handset on the guy's shoulder (... no), I wasn't going to get a decent shot. I had to find out where these came from. I pushed back through the crowd, searching for people with similar platters of terminator snack food or the location of a high security military camp; one of the two. Eventually, I came across a grill that was advertising food from Rebun, an island off the northern coast of Japan. Judging from the map, it would indeed be the perfect place for a biological warfare unit. Then something rather miraculous happened: my Japanese came through. Two places in front of me, I distinctly heard the woman order 'uni' meaning 'sea urchin'. I had eaten sea urchin before; it was a luminous orange, salty semi-liquid of a sea food. I'd had it with a rice bowl and on sushi but never ... well, in a sea urchin. "Sore wa uni desuka," I inquired as I reached the counter. The woman gave me a cheery smile, "Uni desuyo." Comprehension AND communication! I was on fire. "Ichi." I held up one finger. In Japanese, numbers are usually followed by counters; words that indicate the type of object being enumerated. 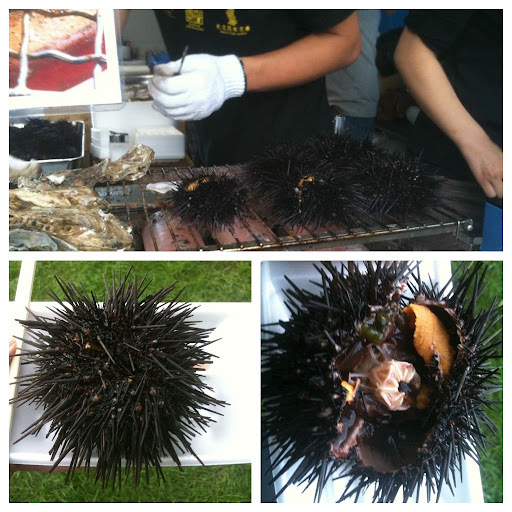 However, I had no idea what the counter for black-spiky-sea-urchin-bomb would be, so the request for 'one' was all she got. I scuttled off to the corner of the lawn with my prize and pried it open with my chopsticks. Inside, there was the familiar orange strips that I had previously eaten, surrounded by green goop. What was the edibility factor for the green goop? Where a score '10' sees you ordering more and a '1' means that it is served at your funeral for company in the afterlife? Unfortunately, I had run away from the other urchin-bomb customers so I had no one close to compare eating habits to. In the end, I concluded that if anything green had to be definitely avoided, this would be one dangerous little number to serve up at a festival. Since no one seemed to be in charge of carrying off dozens of corpses, I ate all the orange, some of the green (I'll give it a '7') and decided that was enough excitement for one meal time. Later, I looked up 'sea urchin' on wikipedia. Apparently, the orange delicacies are actually the sexual organs. Not all knowledge is good.